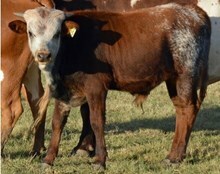 Sugar is really nice foundation type cow with nice coloring and a excellent temperament. 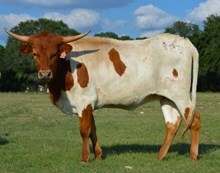 Her horn has the slow twist and roll that is classic for the longhorn. You can never go wrong adding Hubbell and Struthoff breeding to a program. Base 11.0000 10/17/2015 Left Base 11" Right Base 11"
Composite 162.7500 10/17/2015 Left Base 11" Right Base 11"